Sixty Explorer Scouts took part recently in Woking District’s annual two-day Expedition Challenge. 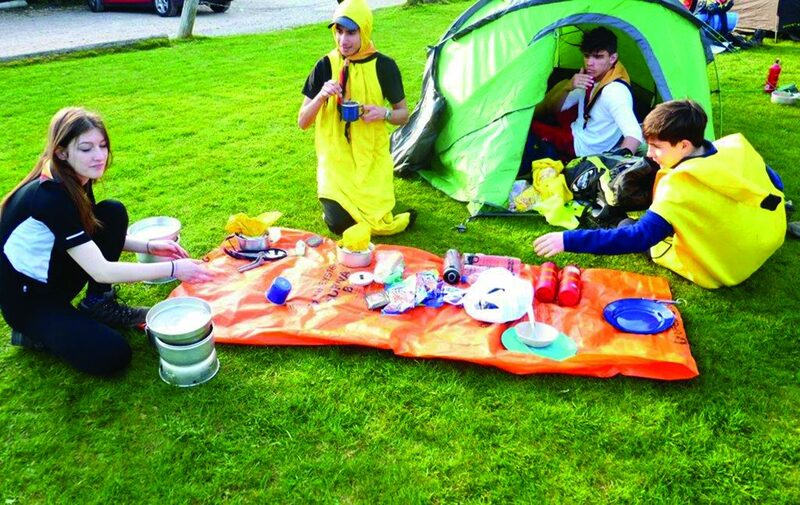 The route led competitive teams of four or five scouts, aged 14 to 18, on a 45-kilometre hike. They carried all their equipment, including food and cooking gear for the weekend, and wore costumes of their team’s choice, such as the Spice Girls, French onion sellers and bananas. The teams had to catch a train early on Saturday, from Woking to their start point at Liphook station. They then had to navigate onto the South Downs and to West Harting Down, before ending the day at their campsite in Rogate. There they cooked and enjoyed meals such as spicy chorizo sausages and pasta, and meatballs and rice. After a cold but frost-free night’s sleep and surviving the clocks going forward, the teams spent a damp and overcast second day hiking back to Liphook and the return train to Woking. During the expedition, the Scouts had to complete a project based on their observations of the countryside and then give a humorous account of their findings. The winning team represented the Explorer scouts at the Phoenix Unit in Byfleet.